Ok, so I was originally going to write more about who I am and my family, but I’ve got to start off with the absolute blast that my kids had yesterday with a piece of plastic and water – your basic slip ‘n slide. I always wanted one of these things as a kid and never got one, but my 6-year-old daughter got one for her birthday in April and has been dying to use it ever since. Yesterday, with the right combination of weather (hot, hot, hot with no rain! ), free time after work and motivation on the part of mom, it worked out really well. Add in several neighbor kids and my girls were in water fun heaven. We did have one casualty – on the part of the slip ‘n slide thankfully, not a child – one of the inflated ‘side’ parts at the end of the slide broke when a 10-year-old slammed into it, but since the inflated parts are 3 separate sections, it caused minimal concern on the part of the now-seasoned sliders. Now, Abby (my 6-year-old) is by nature a fairly cautious kid. It actually took her years to get comfortable in the tubes at McDonalds play places and even now she still usually has her 4-year-old sister show her the way in new and unfamiliar ones. Watching her on this slip ‘n slide was hilarious. Unlike the neighbor kids who had the run, flop down and slide down the thing down pat, Abby’s turn consisted of her starting from a position many feet behind the thing, running toward it (carefully), running down the length of it and then sit down right at the end in the puddle of water created by the inflatable parts and the fact that our yard is on a slight slope. Then splash yourself with water while laughing hysterically. After about an hour, she had progressed to actually flopping down a foot or two before she hit the end of it, so maybe after another few hours at it, she may actually get to the point where she can slide down the whole thing. 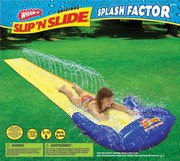 If the slip ‘n slide lasts that long – we’ll have to see on that one. With Abby’s type of use, we’ll have it all summer, but if we get a lot of neighbor kids over again (which I’m sure we will as this thing is a kid-magnet), then we may be lucky to get a few more uses out of it before the whole thing goes kerplooey. It’s great for all ages though – we had kids from age 10 down to my 16-month old and everyone had a blast.